It’s really important and valuable for me to be aware of, and pay attention to, both my strategies and my tactics. 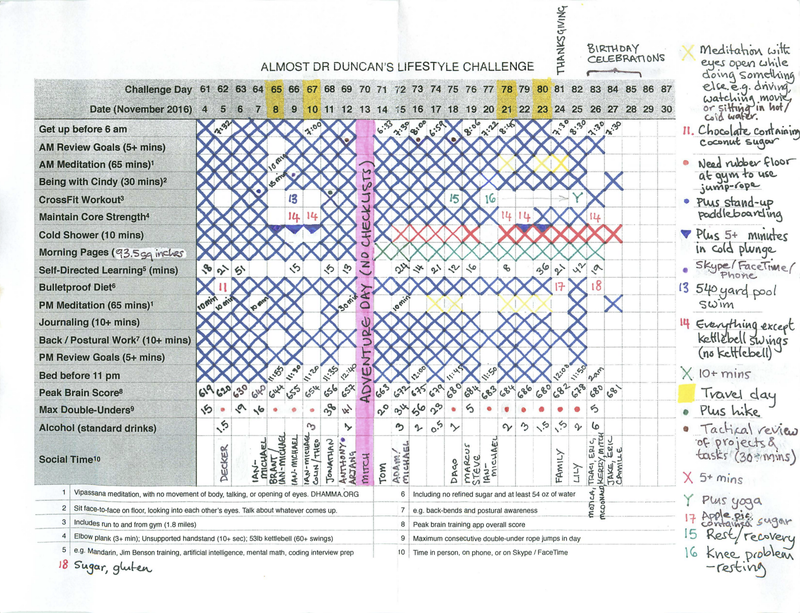 My systematic strategic thinking is currently most apparent in the creation and refinement of month-long lifestyle challenge checklists, and in the goal reviews I do every 12 hours, when I am looking at the larger goals and direction of my life. When I decide what to put on the next months checklist, I am determining what is important to me in terms of creating a basic foundation for my life. When I review my goals, I am reorienting myself to the mid-term and long-term outcomes that I have chosen. Systematic strategic thinking, having a framework in which to think strategically, is something that I didn’t have in my life a couple of months ago. Now that I am systematically doing strategic thinking, I have become aware of a lack of systematic tactical thinking. I find it stressful when I don’t regularly think tactically, because I feel like I’m operating in the dark and I’m not really clear what I need to focus on day-to-day and hour-to-hour. My systematic tactical thinking looks like regular tactical reviews. For example, I have started to regularly review my project and task lists. A review enables me to see what has been completed and what needs to be completed, as well as enabling me to prioritize. It’s hard to feel confident that I’m working on the highest priority item unless I have recently thoroughly reviewed everything that is lined up to be done. I have been using David Allen’s Getting Things Done methodology for over ten years, but I was never consistent with the weekly review, which he views as critical. The more I meditate, the more I become aware of, and validate, how I feel. This has led to me understanding the value of tactical reviews: systematic tactical reviews enable me to feel very calm and focused, and to enter flow states more easily. Another couple of examples of tactical reviews are (1) financial review and (2) calendar and scheduling review. For December, I will be adding a row to the monthly checklist to record my tactical review sessions.